The Ekran system (a.k.a. Stationar-T) was the Soviet Union's first operational geosynchronous satellite and the worlds first direct-to-home TV service. It provided colour television broadcast to Siberia and the Far North. After discarding early exotic concepts of nuclear powered satellites requiring a Fluorine/Amine upper stage, the Ekran concept settled to a more conventional spacecraft. 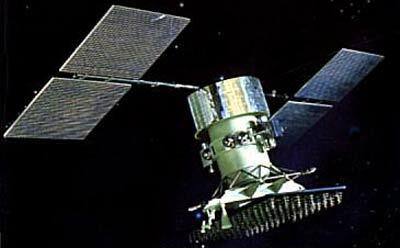 The KAUR-3 bus, which was introduced with the Raduga spacecraft, became the standard for soviet geosynchronous communications satellites. It was 3-axis stabilized using liquid propellant micro-engines and had a pointin accuracy of within 0.25 degrees of the earth's centre. The single-unit body was equipped with solar panels, and active liquid-gas phase-change thermoregulation system, and a corrective engine unit for making orbital adjustments. 25 square meters of solar panels provided 1280 W of power. Ekran featured a 12 square meter phased array antenna, operating at 702-726 MHz at 200 W power. The first flights used experimental satellites, but they already allowed 18 to 20 million additional Soviet citizens to see the Central Television program. Operations were delayed due to continuing problems with the Proton launch vehicle, which caused the loss sof several Ekran satellites. In 1980 the system was accepted for operational service. The satellite broadcast 12 to 16 hours of television programming daily. By 1982 3000 receivers were in operation.